Garlic Lemon Shrimp with Zoodles! Once again Google saves the day! The decision on what to make for dinner? What's in the fridge? Shrimp. So with a bag of raw shrimp, one zucchini, one lemon, three tablespoons of minced garlic, leftover vegetable broth, salt/pepper, red pepper flakes and butter I created this! And man was it good. My inspiration came from EZPZmeals on you tube. Random find. No I'm not endorsing her. I'm just sharing what my idea came from. If you can stand her voice, give it a watch. Other wise follow my directions below as this dish is super easy to make. 2 -3 tablespoons of butter. I guessed how much I used because it was all I had left. red pepper flakes to your liking but for sure put at least a dash or two in. More if you like it hot. I heated up a saute pan and started melting the butter. Added the Garlic, red pepper flakes and italian seasoning right away. About a minute until the butter is melted almost, add the shrimp and let it start to cook. Almost immediately I zested the lemon over the pan. Then I squeezed all the juice of the lemon and stirred. The shrimp started turning pink so I adjusted the heat slightly. Next I added the vegetable broth. You could use seafood or chicken even. But Veggie is what I had. Only needed about 1/4 cup. I think I used too much, which was more like 1/2 cup. By this time a few minutes had passed and the shrimp was almost done so I added the Zoodles, mixed well and covered it to steam the noodles. A few minutes later I added a bit of salt and pepper, opened a bottle of wine and we enjoyed dinner!! Super easy. Took about 20 minutes not counting the time to make the zoodles, which I did with a Julianne peeler from pampered chef. After a day that start at 4:30 am the last thing I want to do is come home and cook. I'm sure this is the case for most of us. I am always amazed at the internet and how easy it is to search the names of two ingredients and find a recipe to make. 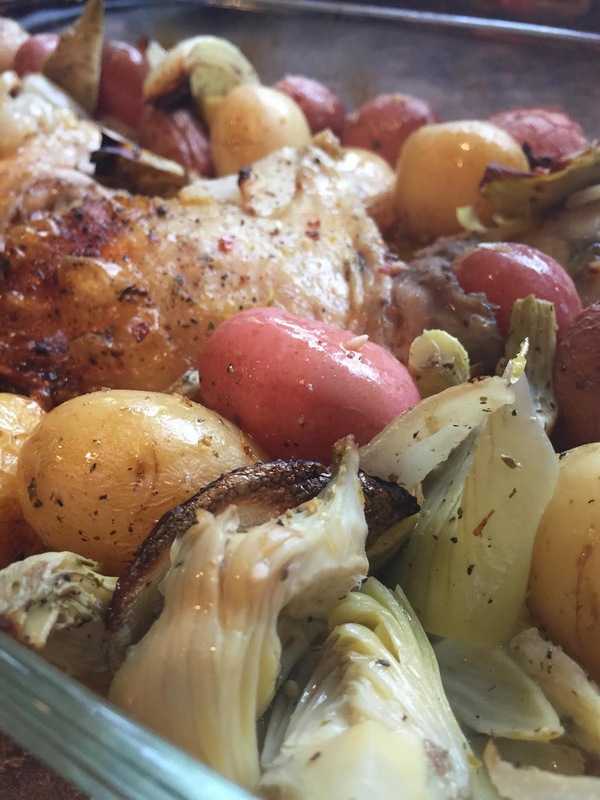 I had some fresh chicken thighs and a jar of artichoke hearts and this is what I made. And let me just tell you the flavor is Amazing!! Of course I altered it slightly and didn't really follow the measurements, but it came out perfect. Super easy, only about an hour total time from prep to eating. And the best part, only a handful of dirty dishes. I added the potatoes for the husband, but I could also see this dish served over pasta. I made sure to include all the juice from the jar of artichokes so it made a nice sauce. I went liberal on the red pepper flakes for a zing and left out the feta cheese. Preheat oven to 400°F. Line a large baking sheet with foil and mist with cooking spray. Using paper towels, pat chicken dry. Zest half of lemon and cut remaining half into wedges. Using tongs, in a large bowl, toss chicken with lemon zest, lemon wedges, garlic, artichokes, potatoes, oregano, oil, salt, pepper flakes and black pepper until well coated. 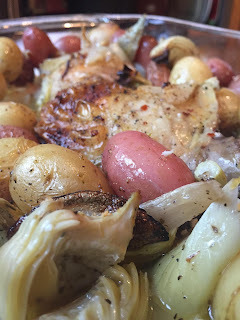 Spread chicken and vegetables onto a large baking sheet or baking dish. Roast for about 45 minutes, turning chicken and vegetables halfway, until potatoes are tender and an internal thermometer inserted into center of chicken thigh reaches 165°F. Remove and discard lemon wedges. Divide chicken and vegetables between serving plates and sprinkle with cheese. The first video is before the shower started. I needed something to hold me accountable. The second video is how I did.